The Mercedes-Benz A-Class is the littlest Benz hatchback, and while in the past it’s had a three-pointed star, it’s never been all that... well, great. Evidently Mercedes is trying harder this time, as the new one that dropped today sure looks a hell of a lot more sophisticated. Mercedes has packed it with all sort of goodies that, until recently, you could only really find in an S-Class, including semi-autonomous functions. And it’s certainly quite sporty looking, wearing a similar face to the new CLS that we saw last year. Inside, it looks like the cockpit of a spaceship. Mercedes gave it the turbine air vents and a dashboard that is split into two “three-dimensional, horizontal sections:the lower section is visually separated from the main body of the dashboard by a ‘trench,’ and it appears to float in front of the dashboard. The ambient lighting enhances this effect, accentuating the free-floating impression of the substructure,” touts the press release. I have trouble visualizing this, so I will just have to wait and see it in person. Mercedes tells us that there will be 64 colors to choose from for the ambient lighting. I can’t even name 64 colors, so that’s cool, too. The new A-Class is also apparently very safe: each piece of its body is made of high-strength materials and has a very rigid passenger cell, kind of like how Smarts are made. It’s been made roomier so it can fit more passengers and things, thought I still think seating two adults in the back will be tight. The A-Class will be offered with three engines. The A 200 will have 163 horsepower, the A 250 will have 224 HP and the A 190 d (which we will most likely not get) will have 116 HP. All three will also come fitted with seven-speed dual-clutch transmissions. The two new gasoline engines are the 1.4-liter turbocharged four-cylinder and the 2.0-liter turbo. It will have permanent all-wheel drive. Mercedes notes that the A-Class can be ordered starting in March, though it’s unclear if that’s for the European market for the U.S. market. We’d also like to point out that this was a press release for the A-Class hatch, which we probably won’t be getting. Back in December, we reported that we’d would get the sedan here instead, but I can’t imagine the stats or the interior would be much different between the two. Here, look at the nice hatch for now. It may be your next rental car in Europe. 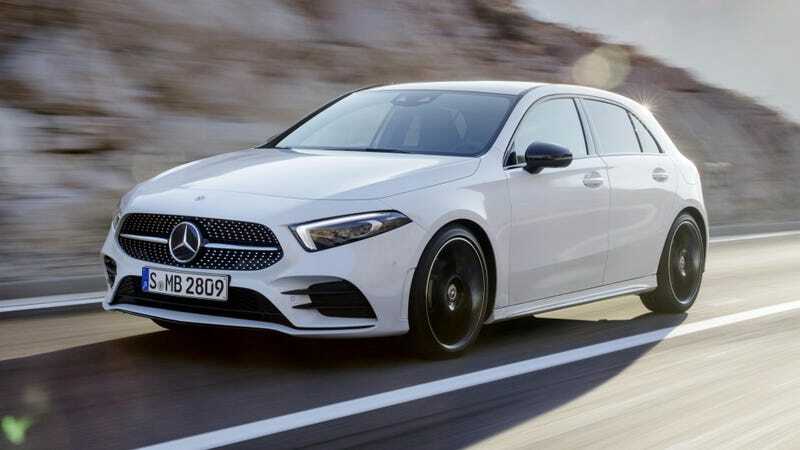 Update 3:10 p.m. EST: A Mercedes-Benz spokesperson clarified that the A-Class sedan is launching in the U.S. market by the end of the year and confirmed that the hatch won’t be sold here. But it will be in Canada! Just another reason to visit. Mercedes Says They&apos;re Bringing An A-Class Sedan To The U.S., But Will It Sell?